New! Free Memory Maker to Cherish Your Disney World Moments: Imagine capturing your favorite pictures from your Disney World vacation! You can do that with Disney’s Memory Maker. Book a package from August 15-September 30 for at least 3 nights with 2-Day tickets and get the new Memory Maker free. Prices start from just $899 plus tax for a family of 3 at a Disney Value Resort. Save up to 30% on Rooms at Select Walt Disney World® Resort Hotels: Savings apply for stays most nights March 14, 2014 - April 12, 2014 and April 20, 2014 – June 15, 2014. Upgrade to a room and ticket package with a minimum 4-day Magic Your Way Ticket and get one more ticket day FREE! Visit Destinations in Florida for more details. 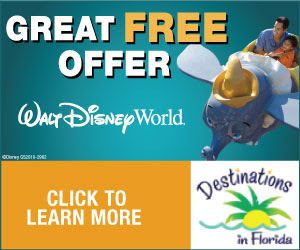 Florida Resident Rates: Florida Residents can take advantage of great rates on rooms at select Disney Resorts hotels for stays through May 29, 2014. Plan a winter getaway to Disney or a Spring Break trip to the Disney Water Parks. Book today with this incredible deal, just for Florida Residents. Save Up to 25% on Rooms at a Disneyland® Resort Hotel: Save up to 25% on rooms at a Disneyland Hotel most Sunday through Thursday nights through April 10, 2014. Book by March 6, 2014. Special Rates for Florida Residents and US Military: Take advantage of special deals from $135 per person per night plus tax/port charges for Florida Residents and active/retired United States Military. Special cruises are available for select dates in February. New! Last Minute Restricted Deals: If you are flexible about the location of your stateroom and willing to book last minute you may be able to save BIG! Disney offers Restricted Guarantee rooms 15-60 days before departure dates, sometimes just a few days before departure. These are very restricted and with many rules, but if you are not picky you can save up 40%. Get a Free Night and Free Breakfast: For a limited time, when you purchase a minimum 4-night stay at Aulani, A Disney Resort & Spa, you’ll get the 4th night free - including breakfast daily for two adults at the new Ulu Cafe. This discount is good for most stays through April 7, 2014. 4th Night and 3rd Day Free: Book a Universal Partner hotel for 3 nights with a 2 Day Base ticket and receive your 4th night and 3rd day at the parks for FREE! Save up to $500 on your Universal Package: Stay at one of the Universal Hotels including Cabana Bay Hotel, Royal Pacific Hotel, Hard Rock Hotel or Portofino Bay Hotel with tickets and save up to $500 on your package. Now is the time to visit the movies at the Universal Orlando Resort. Up to $400 to Spend During Your Cruise: Book select 2014 cruises in Europe by February 28, and we'll give you up to $400* to spend during your vacation. Use it anyway you choose. Dive into a specialty dinner for two or discover pure bliss at the spa.